The appeal of steel wire ropes and cables lies in their durability, resistance to abrasion, and the ability to withstand greater loads without failure when compared traditional organic fiber ropes. Stainless steel can even mitigate the risks of rust and corrosion that are a major weakness of metal ropes. So why, then, are more synthetic fiber ropes appearing in industrial settings, and can they really exhibit strengths that are many orders of magnitude greater than steel? Whereas all steel cable grades are some variation of an iron-carbon alloy with additional minerals that tune its properties, there is a far greater range of materials in synthetic fiber ropes. This is incredibly useful and allows each synthetic rope to be constructed of material specifically selected to suit a specialized purpose with unique traits (stretch, heat or corrosion resistance, shock absorption, etc.). Dyneema (high modulus polyethylene, or HMPE) is “15 times stronger than steel,” and only 15% the weight. Made with robust UV and abrasion resistant fibers, it exhibits excellent dynamic fatigue, low elongation/elasticity, high strength, and is the only high-performance fiber that floats. Under very high loads for long periods of time, it tends to creep. Dyneema as a melting point of 297℉, and a critical temperature of 150℉ (where strength loss begins). Zylon (Polybenzoxazole crystal polymer, or PBO) is a fiber that has nearly Dyneema’s tenacity and free breaking length with virtually no creep. However, it loses strength more quickly than HMPE as it ages or is exposed to UV rays/chemicals, has much less abrasion resistance, and is the heaviest and most expensive high-performance fiber. Protective covers are recommended to preserve its high breaking load and hinder environmental degradation. Kevlar, Technora (aramids) has almost no stretch and impressive abrasion/heat resistance—a braided ⅜-inch rope to retain its tensile strength of 17,800 pounds up to 320℉, and a melting point of 932℉—but it also has low UV tolerance and poor bending/fatigue properties. The hook-shaped fibers damage themselves when bent, meaning it is useful for pulling but will weaken over time or break if stressed on pulleys or knotted. Aramids are usually favored in applications when the temperature is the main concern (e.g. hot air balloon ropes). Vectran (liquid crystal polymer, or LCP), has minimal stretch or creep, chafe resistance, and is advertised to be five times stronger than steel (like aramids), but has poor UV tolerance. It also has advanced heat resistance and is not highly sensitive to bending over sharp edges, giving it a different niche than kevlar. Braided covers to block UV rays are commonly used. Dacron (polyester or PES) ropes are often the first choice for general, low-profile applications. PES is slightly stronger than regular Nylon (but with similar tensile strength to Nylon 6), with less stretch/elongation, very good UV and saltwater resistance, and a specific gravity of 1.38 that allows it to float in water. It doesn’t absorb high impact forces as well as Nylon. Nylon (polyamide, or PA) has good tensile strength and handling qualities, but less UV resistance and it tends to be weaker (by 10-15%) when wet. It can become stiff after too long in wet conditions. The high elasticity characteristic of Nylon makes it most suitable to situations where generous energy/impact absorption is an advantage—it’s often used to absorb shock loads. XLF (polypropylene, or PP), is lightweight and highly buoyant, but has less abrasion or temperature resistance than other fibers. Its breaking loads and elasticity traits also lag behind other options, making it best suited as the economical choices for simple applications. With so many options on the market, more detailed diagnostic comparisons can help distinguish the advantages each synthetic fiber brings to the rope. Although their exact strengths and properties vary, all of these fibers can be viable alternatives to (or improvements over) steel cable due to the advanced science that has given them far greater strength and durability than older organic fiber ropes. Heat and abrasion have historically had a major effect on the strength of synthetic fibers. Early synthetic designs were sometimes vulnerable to harsh sunlight, ultraviolet radiation, high friction, heat, and scraping or cutting. However, modern synthetics have incorporated solutions such as protective sleeves, coatings, chemical treatments, and more advanced molecular structures to greatly reduce the impact of these environmental factors. Synthetic fiber ropes exhibit various tensile strengths according to their weave and construction (monofiliment, multifilament, textured fibers, etc. ), material composition (of which there are many options), and environments (Kevlar performs better than others in extreme heat, for example). 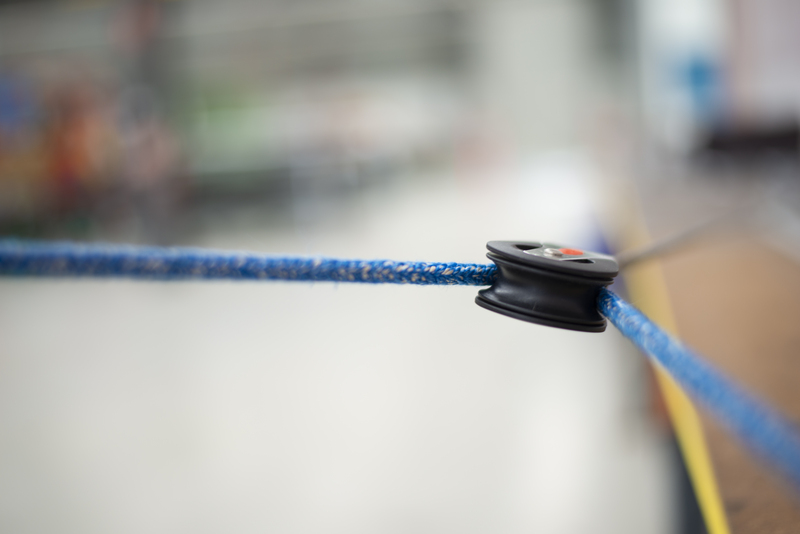 Dyneema is the strongest when matching 24mm diameter ropes are tested. Aramids (Kevlar and Technora) can rate slightly higher when compared to Dyneema at 12mm. Vectran has tested stronger than the others in wider 96mm ropes. To test the claim that synthetics are stronger than steel by a multiplier of 15, Dyneema is the sensible choice, given that it is often advertised with this figure and typically exhibits the highest tensile strength among synthetic fibers. Better yet, the Dyneema Ocean 5000 is an evolution of Dyneema rope that has drastically improved upon the breaking strength, making it one of the strongest materials for rope on the market today. It is a pre-stretched, heat set, braided synthetic rope with resistance to abrasion and UV radiation, and far lower creep than less premium varieties. Carbon steel, when not treated or coated with other substances, is commonly referred to as “bright” wire. A lack of corrosion resistance relegates bright steel cables to stable interior environments—where they won’t quickly rust and fail—and it is the cheapest to produce. Stainless steel is a versatile iron-carbon-chromium alloy—less-commonly called “inox”—with natural corrosion resistance and strength, low maintenance, and the capacity to take enormous loads. It is therefore generally considered the highest quality metal wire rope available, but also the most costly. The upgrade can be a tough expense to avoid in steel, where corrosion resistance is critical to its useful life, especially in the severe weather and unstable environments faced by a winch cable. Synthetic fibers, however, have become similarly hardy and resistant to chemical and environmental degradation, and as a result, don’t need to be upgraded or replaced the way steel cables do. The actual strength of a stainless steel cable will depend upon its exact usage, strand/core construction, alloy composition (grade), and diameter. Use: A major consideration for most wire ropes—unless used as stationary guys and supports—is that they are subject to bending around drums and sheaves. There is a loss of strength due to bending (such as when repeatedly flexing around a winch) of around 4% for steel cable—and sometimes as high as 6%—even in common use. Structure: This loss is because steel rope is more rigid than synthetic fiber. Unlike fiber, which deforms and spreads its load to more fibers, the outer diameter of a steel cable carries all of the load and the inner does nothing. The hard strands and wires also scrape against each other during flexion, and the resulting internal abrasions slowly degrade it. A cable with strands made of fewer, larger wires accumulates faster damage from bending fatigue. To compensate, using numerous fine wires per strand will increase bending tolerance, but unfortunately, also decrease resistance to abrasion (steel’s major selling point). Alloy: Beyond the structure of the strands, the unique mineral balance of a stainless steel alloy also affects its properties and strengths. Many steel alloys can withstand temperatures up to or over 1000℉ (some as much as 2000℉) without failing or experiencing precipitous drops in strength, although these temperatures are rarely relevant in most industrial applications. Diameter: It is the diameter that actually has the most mathematically significant influence on a steel cable’s tensile strength. Therefore, we’ll consider a fair test of Dyneema Ocean 5000 and a stainless steel cable in matching diameter and size. It is well documented that synthetics—like Dyneema—can indeed be as strong or stronger than steel on a per-diameter basis. But by how much? Due to the multiplicity of fibers and alloys available, the research comparing synthetic rope strength to steel cable has had varying results. So let’s narrow it down: Type 304 stainless steel—an 18% chromium, 8% nickel alloy—is a common grade for stainless steel, due to its machinability, decent corrosion resistance, and high strength. This grade is often preferred for welding, bending, and forming. However, the leading corrosion resistance of Type 316 (surgical and marine grade steel) makes it ideal for a stainless steel winch cable on a vehicle. This more refined alloy adds manganese (2%), molybdenum (3%), and additional nickel (12%) to tune it for severe settings with pollutants, sub-zero temperatures, contact with harsh substances, etc. Though it is more brittle than 304, it has comparable strength and quintessential resistances, so we’ll consider an equal-diameter cable of this kind in our comparison. Now, given two identical winch cables tested in neutral conditions (same width and length, no fatigue, a controlled environment, straight-line load), a few differences quickly emerge. First, at the same thickness, the high density and hardness of steel will make it durable and tough to cut, but also incredibly heavy and awkward to handle. Heaviness does not directly correlate to strength or abrasion resistance, either, as synthetic ropes have been formulated that can also withstand fraying from harsh stresses and friction at a fraction of the weight. Next, if you were to apply gradually increasing straight-line tension to the two winch ropes, one of ⅜-inch 12-strand Dyneema Ocean 5000, and the other a ⅜-inch Type 316 steel wire cable, the steel cable will be the one that snaps first. In fact, the Dyneema will outlast it by several thousand pounds before it reaches the breaking point. The steel will tolerate 21,840 pounds by a point of partial or total rupture, whereas the Dyneema Ocean 5000 has the ability to withstand 24,726 pounds before it breaks. The claim that synthetic rope is 15 times stronger than steel cable actually originates in a comparison of the two materials by strength-to-weight ratio. Dyneema has a dramatically higher tenacity (strength per weight) than steel and can tolerate up to 15 times the load that steel rope of identical length and weight can hold before failure (precise ratio pending other factors). This is because synthetic fiber ropes are remarkably lighter than their steel counterparts in a similar size, length, and diameter. For example, a ⅜-inch, 100-foot winch line made of steel weighs approximately 24.3 pounds. Made of Dyneema, it weighs only 3.4 pounds, which is more than 7 times lighter than steel. Thus, it would take roughly 7 times the volume of Dyneema rope (and an accordingly thicker diameter) to match the weight of a steel rope of equal length. To illustrate, if you imagine seven ⅜-inch Dyneema ropes bundled together, it would seem sensible—by the eye test alone—that they would collectively withstand much higher tension than a single ⅜-inch steel rope. Fortunately, a single Dyneema rope is all that you would need to get better performance than steel at a seventh of the weight. It’s also notable that Kevlar is advertised as 5 times stronger than steel, where Dyneema is 15 times stronger. However, both ropes being ⅜-inch, Kevlar withstands close to the same load as standard Dyneema. This is likewise due to strength-to-weight ratios. Kevlar has a higher density (1.44) than Dyneema (0.97), and so it scores lower on the ratio compared to steel. In truth, the strength of both materials is comparable (Kevlar has a tensile strength of 3620 MPa vs. Dyneema’s 3600 MPa)—although Dyneema is desirably lighter—and both are stronger and less ponderous than steel in ropes of the same size. Furthermore, steel’s dense weight and hardness make it incredibly dangerous when it does fail, as the strands unwind and whip unpredictably with incredible force. Fiber ropes store negligible degrees of kinetic energy when under tension, whereas taut steel cables bottle up deadly force. In the event of a break, the whip of steel can kill while fiber typically just makes noise. Partial failures are not uncommon; a steel cable tensed to its maximum load might experience a rupture that sends some of its wires slicing and spinning even before it completely breaks. And it will break—15 times sooner than Dyneema when compared at equal weight. While the method of comparison is important, there is truth to Dyneema’s claim of incredible 15-times-steel-strength. Pound for pound, Dyneema can withstand truly incredible loads at a far more advantageous strength-to-weight ratio than steel. Even when compared diameter for diameter, Dyneema is the superior choice, outperforming steel while minimizing the drawbacks of a metal cable’s cumbersome weight, dangerous failures, weakness and fatigue due to bending, and susceptibility to rust. Fiber rope can turn tighter corners and is even stronger proportionally as its diameter shrinks. When you choose Dyneema rope as a steel cable replacement, you take advantage of the latest advances in the science of synthetic fibers to improve your tensile capacity with less hassle than the heavy steel options of yesteryear. Other synthetic fibers can perform almost as well, in exchange for their own traits and tradeoffs, but Dyneema continues to become the standard in many industries that previously relied on steel cables, such as the marine, telecommunications, climbing, wind farm, offshore oil, construction, and other industries. Many modern synthetics can be further sleeved or premium treated to minimize their weaknesses and lengthen their lifespans in all environments (like Dyneema Ocean 3000 and Dyneema Ocean 5000). The considerable benefits of these chemically advanced and stronger ropes make them a modern alternative to a steel cable that has already drawn many companies to switch for simpler, safer handling without any dropoff in performance.